After 25 years of admiring is work I’ve always wanted to meet George and in 2004 I got my wish. I heard George was appearing at Fan Expo in Toronto. I had planned a trip for the first time to New York City just beforehand and I remember arriving back in Montreal just in time to drop my luggage and take a bus out the next day to Toronto. I decided to visit his booth on the Friday night when it would be less busy. I asked if I could take a picture of him, he said sure and asked if I wanted to be in the picture, I was there alone but luckily another fan agreed to take my camera and the pic. He noticed as I went up to pose with him and put my arm around him, that I was shaking, and he asked if I was OK, I told him that for me, meeting him, was like meeting the Beatles, I knew George was a big Beatles fan, and he totally understood. Unfortunately that picture was taken with my old film camera, something went wrong and it didn’t come out. Luckily I got to meet him again in 2006 back in Toronto at Fan Expo and got a shot with my new digital camera. Sometimes you meet your idol and they are not who you expected them to be, sometimes they can disappoint you but George surpassed all my expectations. He was the nicest guy, gracious and spending his time drawing for charity. I could kick myself for not asking for a commission all those years ago what I wouldn’t give for one now. According to the Treasure HD schedule on the site, the 'Comics' episode of Collector Showdown (which must be the episode that George Perez appears in) airs again on October 11th at 8am, 12pm and 4pm. Millions of Canadians collect something – and in the process, become quite knowledgeable about their chosen passion. But just how much do they know? Collector Showdown takes two people who have amassed collections in the same or similar areas, and asks them to prove just how far their expertise goes in a unique format that any collector - or non-collector - will enjoy. In the end, only one of them will have bragging rights and a result that will be fun, unusual - and totally unexpected. Last week at the real Toronto Comicon I was part of a show called Collector's showdown. I probably shouldn't tell you if I won or lost but at the end of the show I received a sketch of Superman by George Perez and personally signed with a message by the man himself. It is beautiful. Mr. Perez was extremely patient as I went completely 15 year old girl Beatlemania style on him. He signed my New Teen Titans Number 1... Crisis number 1 and the hardcover version (both on the inside and on the dust jacket). He then listened to me prattle on for 20 minutes about what a fan I was... and the usual stuff. I just wanted to say how much I appreciated his graciousness and patience. He made me feel like I mattered and shared some good stories. So thank-you Mr. Perez for a great experience. For those interested the show is tentatively called The Collector's Showdown.. it should air in Canada in July on HiFidelitytv.. they are looking to sell it in the USA. SPACE brings you the highlights from Toronto Comicon 2006. While at Toronto Comicon last weekend, Paula caught up with original Teen Titans comic book artist, George Perez. Check it out! Subject: Attack of the 50 ft. George Perez!!! Also, Paradise Comics Toronto Comicon founder and promoter Peter Dixon agreed to get his head shaved at the con if fans donated $1000 to ACTOR. The generous Toronto crowd donated just over $1200 for the shearing, and Peter got his head shaved. “For sale, one tube of hair gel, slightly used, and one hair brush. $5 bucks or best offer,” said Dixon. With enough money raised for the 'shave fund,' (see www.actorcomicfund.org ) it was time for Peter Dixon (owner/operator of Paradise Comics and the con's promoter) to have his head shaved as the Paradise con wound down. Photo 1: After an apparently blind person took clippers to Peter's hair, Gail Simone (Birds of Prey, Secret Six) steps in and tries to even out the back. George waits in the wings for his shot at playing barber. Photo 2: With most of the cutting/shaving done by former hairdresser Simone, it's George's turn - but not before he tests the shaver on his own dome. Peter looks forward to the impending bald-dom(e). Photo 3: George opts to sketch Zatanna on Peter's head instead of getting that last bit of stubble. "Sknaht a tol, Egroeg," Peter thinks. Photo 4: George inspects his handiwork, contemplating whether he should ink Peter's head himself. Photo 5: George summons the powers of the Flash to vibrate out of there as Peter's mind-wipe wears off. Gail Simone readies the taser. Photo 6: Hawkgirl prays (bird of pray?) to the Thanagarian hawk-gods for the speedy return of Peter's hair, while Peter snaps. Photo 7: Peter looks down at the silhouette of Superman on his shirt, admiring the man of steel's plentiful hair. Gail Simone takes George's toy away. While at the Paradise con, George took the time to appear on a scripted television program called Collector Showdown. From what I could gather, George (playing himself) picks the winner of a drawing contest. Later, the winner of the contest is awarded a shopping spree at the con, while the consolation prize for the loser ends up being...a gorgeous Superman sketch by George. Oh, the irony! The 'set' for the show was the convention floor, and George presented the Superman sketch to the 'loser' of the contest in front of the ACTOR booth. George's appearance on Collector Showdown is expected to air on the high definition channel Treasure HD in July. Treasure HD is a new Canadian 7/24 High-Definition specialty channel celebrating the rarely seen world of art, rare collectables and the inspired hunt by collectors for beautiful, interesting and unique treasures from around the globe and across history. Treasure HD explores diverse worlds of visual arts - from humble studios and modern galleries to the world's great museums and venerated institutes - always uncovering unseen treasures and the people who pursue them. The winning bidder of the 'Lunch and a sketch with George Perez' ebay auction (with the proceeds benefiting ACTOR) received the following Wonder Woman sketch at the Paradise Comics Toronto Comicon. Here was my plan: to seek out George Perez at the Paradise Comics Toronto Comicon, to boldly go where no fan (to my knowledge) has gone before - yes, my mission that weekend was to photograph as many of George's sketches (done for ACTOR) as I possibly could. So...was my mission accomplished? I think it was...and then some. My thanks to George, Vu, Peter Dixon, Jim McLauchlin, Richard & Nancy Zajac, everyone working the ACTOR booth and all the fans who let me photograph their sketches for making this happen. On with the show! More updates to come! Sorry for not putting this up sooner. Saturday was a long day, and a long night, that I just had to crash and not write anything. Hell, I'm tired now, but I do want to get this up. Got to the convention, went straight for George Perez. First, to get some books signed. Second, to pick up the sketch I got my name down for. I just fell in love with that. It's beautiful. Gotta pick up a frame for that. I just thought I would share with you what I got from the Toronto Comicon. I was lucky enough to get another sketch and George also showed me what he has done so far on the new (and last) Wonder Woman trade. I didn't get to spend allot of time at the con but getting a new sketch and a little chat with George was more than what I hoped for. This weekend the Toronto Comicon, hosted by Paradise Comics, is taking place at the National Trade Centre in Toronto, Ontario. The convention, which is Canada's largest show, will feature such industry guests as Brian Azzarello, Talent Caldwell, J.G. Jones, Jimmy Palmiotti, Amanda Connor, J. Michael Straczynski and Jill Thompson. Hours for the show are: Friday 3:00 pm - 8:00 pm; Saturday 10:00 am - 7:00 pm; and Sunday 11:00 am - 6:00 pm. Passes to the show are $18 for a one-day pass and $34 for a three-day pass. Children 12 and under are free with a paying adult. Visit www.torontocomicon.com for more information and show programming. Item number 6273661297: LUNCH AND A SKETCH WITH GEORGE PEREZ! LUNCH AND A SKETCH WITH GEORGE PEREZ! You are bidding on a once-in-a-lifetime opportunity to spend some quality time with an absolute legend of comics: George Pérez! The winner of this auction will get to have lunch with the artist of Crisis on Infinite Earths, Infinite Crisis, Avengers and more! The lunch will take place near the Paradise Comics Toronto Comicon on Saturday, April 29 at approximately 1 PM. Winner must go to the ACTOR booth at Paradise Comics Toronto Comicon to redeem. Lunch is on ACTOR at a fine local restaurant, AND George will also give you a personal one-character original sketch of a character of your choice! 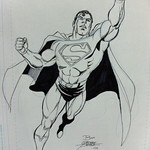 WHAT: Win Lunch And A Sketch With George Pérez! WHO: George Pérez is an ACTOR board member and artist of Crisis on Infinite Earths, Infinite Crisis, Avengers and more! Auction bids expressed in $USD (United States Dollars) and must be paid for in same. We accept PayPal! Lunch with George Pérez is a benefit for A Commitment To Our Roots (A.C.T.O.R.) Comic Fund. A.C.T.O.R. is the first-ever federally chartered not-for-profit corporation dedicated strictly to helping comic book creators in need. A.C.T.O.R. creates a financial safety net for yesterdays' creators who may need emergency medical aid, financial support for essentials of life, and entrée back into paying work. For more information, visit www.ACTORComicFund.org or call 310-909-7809. A.C.T.O.R (A Commitment To Our Roots), along with eBay, is auctioning off lunch and an original sketch to comic fans to raise money for the charitable fund which supports the creators of yesteryear. Fans can bid for the chance to have lunch in Toronto with both George Pérez and Frank Cho, sponsored by Paradise Comics. Paradise, which is hosting the Toronto Comicon this weekend, has arranged for one lucky bidder to sit down with Pérez on Saturday, April 29, 2006 and with Cho on Sunday, April 30, 2006. Fans can bid on both of these wonderful opportunities to support A.C.T.O.R. and meet these creators (George Pérez and Frank Cho) up until 9:00 pm tonight. For more information on the Toronto Comicon, visit www.torontoComiCon.com. For more information on A.C.T.O.R, visit www.ACTORComicFund.org. DC Comics’ top dog eager to connect in T.O. The Women Of Comics will take centre stage at the Paradise Comics Toronto Comicon this weekend, but that doesn’t mean they won’t let the men come out and play. There’s an all-star list of dozens of creators, including Greg Rucka (52, Checkmate), Frank Cho (Liberty Meadows), Michael Lark (Daredevil), Brian Azzarello (100 Bullets) and Dave Sim (Cerebus) and featuring guests of honour David Lloyd (V For Vendetta) and George Perez (Infinite Crisis). Metro: Infinite Crisis has been one of the biggest and most successful comic projects in years. Do you think the payoff is going to be worth the buildup? Note: Two panel rooms will be operating on Saturday and Sunday. Panel names and participants are being finalized and a more complete list will be made available in the upcoming weeks. Panels will run 5O Minutes. The convention gets rolling with a special hour with 2006 Guests of Honour George Perez and David Lloyd and 2006 Joe Shuster Awards keynote speaker Gerard Jones! Moderated by PopImage's Jonathan Ellis. Looks like the Toronto Comicon Program Book 2006 is going to feature a new cover by George Perez! Ilke, if you're going to the convention - pick up a program book for me ! This is a list of the comics conventions I will be attending in 2006. Some are "rain-check" appearances for shows that I had to cancel in 2005 due to health reasons. In some cases this puts me in a position of attending some conventions on back-to-back weekends, but it couldn't be helped. I hope to be able to get together with a lot of my fans next year and will be warming up my autograph hand. I will also be attending the October Portland, OR show for Second Genesis (another rain-check from 2005) but I still have no confirmed date. That should keep me busy for the year in between issues of THE BRAVE AND THE BOLD. Stan Lee Appearance Change. New Guests Announced. GEORGE PEREZ SIGNS ON AS GUEST OF HONOR. Due to increased work commitments Stan Lee will be unable to attend the April 28-30 2006 Paradise Comics Toronto Comicon, where he was slated to appear as the Guest of Honor. Industry Legend George Perez signs on! Paradise Conventions is proud to welcome master illustrator and industry legend George Perez to the 2006 Paradise Comics Toronto Comicon as Guest of Honor. George Pérez began his comics career in 1973, assisting Rich Buckler on a back-up story in Astonishing Tales. A year later, he was assigned by Marvel to do some stories for the Deadly Hands of Kung-Fu and Creatures on the Loose titles. He then became a regular artist on such comics as Fantastic Four, The Inhumans and The Avengers. He eventually left Marvel and joined DC, where he created his best remembered work, The New Teen Titans with Marv Wolfman. He drew this title for four years, after which he took on the limited series Crisis on Infinite Earths, again with Wolfman. He then drew the encyclopedic History of the DC Universe and had a run on Wonder Woman, a comic for which he also wrote scripts. He was present at Marvel again in the early 1990's with the limited series The Infinity Gauntlet, The Incredible Hulk: Future Imperfect and Sachs & Violens. He inked Gil Kane's adaptation of Jurassic Park for Topps, and briefly joined Malibu Comics and Tekno-Comix on different projects. He returned to DC as the inker of The Teen Titans and in 1997 he returned to The Avengers. In addition, he began his own creator-owned mini-series Crimson Plague for Event Comics and Solus at CrossGen. In 2003 he undertook, with writer Kurt Busiek, every fanboy's dream and illustrated the JLA/Avengers inter-company crossover for Marvel and DC. Mr. Perez is currently illustrating the covers to the blockbuster Crisis-inspired mini-series Infinite Crisis, with interior art by another Paradise Comicon guest, Mr. Phil Jimenez. “The call went out far and wide” said Kevin Boyd, Paradise Conventions co-promoter and Comicon organizer, “and Mr. Perez answered! We are extremely honored to have Mr. Perez joining us for our fourth year.” 2006 marks the 20th anniversary year of the conclusion of Crisis on Infinite Earths (soon to be republished in an oversized "Absolute Edition" hardcover by DC Comics), and the publication of the History of the DC Universe mini-series.